On October 20th, according to foreign media reports, XDA God used JEB Decompiler to decompile Xiaomi firmware to obtain some details of MIX 3. 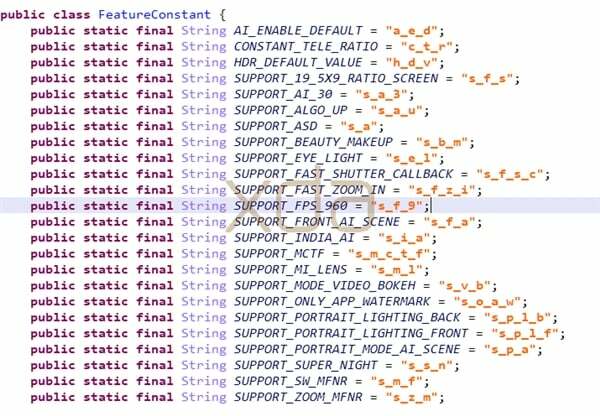 It is reported that XDA developers found the “SUPPORT_FPS_960” string in the list of functions codenamed “perseus”. This means that the device supports 960 frames of super slow motion video capture. XDA developers learned from the previous test firmware that the code name “perseus” is the flagship of Xiaomi’s upcoming release, which infers that Xiaomi MIX 3 will support 960 frames of super slow motion. Video shooting, this will be the flagship of Xiaomi’s first 960-frame super slow-motion video. According to the official information, Xiaomi MIX 3 adopts a sliding screen full screen, which has nearly 100% screen ratio, which is the current screen with the highest proportion of millet. Compared with the previous generation Xiaomi MIX 2S, Xiaomi MIX 3 also greatly upgraded the self-timer. Its front-facing 24 million soft light double camera, this is the first front dual-camera mobile phone of the Xiaomi MIX series, the self-timer effect is worth looking forward to. In the core configuration, Xiaomi MIX 3 may be equipped with Qualcomm Snapdragon 845 processor, with up to 10GB of memory, will be the world’s first commercial 5G mobile phone. The Xiaomi will be officially released on October 25.